Projects three lines or three dots, Locking mechanism protects inner pendulum during transportation, Manual mode allows unit to tilt at extreme angles, Self-leveling with visual and audible alarms when beyond leveling range, Multi-functional magnetic base with rare earth magnets for use on walls, and metallic surfaces or tripod. 40-6683 Includes > Laser, multi-functional magnetic base, 3 "AA" alkaline batteries, mounting strap, magnetic target, tinted glasses, and hard-shell carrying case. 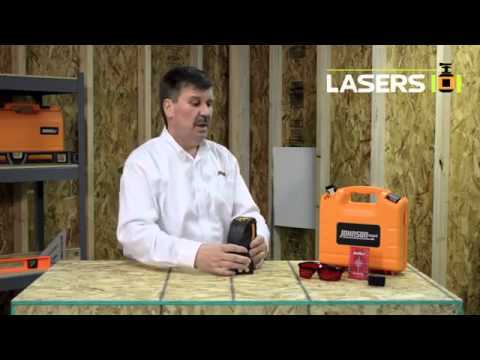 The Johnson 3-line or 3-point laser provides a self-leveling combination laser level for construction professionals to measure using 3 lines or 3 dots. Both can be projected together or individually. The Johnson Level 40-6683 can be used for the following indoor applications; drywall installation, sprinkler installation, HVAC, ceiling joist and rafter alignment, wallpaper and stenciling/painting, tiling (walls and floors), electrical outlets and switches, install conduit and wiring, curtain walls/shower doors, windows, cabinet and countertop alignment, soffits, chair rain/trim, closet shelves/doors, paneling/wainscouting, setting foundations and footings, alignment of concrete forms, layout of interior walls, room additions/partition installation, plumbing and pipe installation, machinery installation, track and canned lighting, align brick, square up battered boards, align fences, plumb posts and pickets, align 90 degree joints and edges, level cabinets, shelving and countertops, check door and window heights, acoustical/drop ceilings, layout warehouse racking, squaring floor and wall tiles, align and plumb walls, level floors, metal stud and wood framers.